Part 1 of a series on the current conjuncture of capital accumulation and class struggle in Australia. Something is going on. Something is changing. There is a shift in the trajectory that capitalism in Australia is taking. At the recent National Reform Summit Martin Parkinson, a former head of Treasury remarked that ‘Unless we actually grab this challenge by the horns and really get concrete about what are the priority issues, we are actually going to find ourselves sleepwalking into a real mess’(Martin 2015). The metaphor of Australia sleepwalking towards recession is now resonating in the echo chamber of the political class and sums up their dual concerns: on the one hand a decline in the accumulation of capital; and on the other that the political apparatus and the broader society seems unable to do anything to change course, perhaps is even aware, and is moving without, or despite of, conscious control. Australia is slouching towards, or is already sunk in, political and economic malfunction. Whilst the political class wants to address these dilemmas and act to save capitalism from itself we want to understand what is going on so we can overcome it all. Here I want to grasp the current conjuncture of capitalist society in Australia: in particular the current malaise of capital accumulation and the malfunctioning of official politics. What do these phenomena tell us about the current moment in Australian capitalism and the possibilities, overt or covert, for a radically different kind of society? This is part one of a six party study to try to sketch an outline of the current conjuncture of capitalism in Australia. Part two will focus on debt, part three the crisis of mainstream politics, part four on the end of the ‘high credit, high work, high consumption deal’, part five on gender and social reproduction and part six on the most prominent fault lines of struggle. But here we will start by posing a hypothesis about capital accumulation in Australia and also try to take its pulse-rate. Hypothesis: The end of the mining boom is a manifestation in Australia of a global crisis of capitalism. The end of the mining boom is a manifestation in Australia of a global crisis of capitalism as a ‘civilisation’ or ‘world-ecology’(Dauvé 2015, Moore 2003). This crisis is a product – within a specific historical context – of the capitalist mode of production’s general tendency to over-accumulation. Capitalism’s dynamism, arising in no small part as a reaction to struggles, generates a general tendency to replace human labour with technology leading to a downward drift of the rate of profit and the production of volumes of commodities that struggle to find enough buyers to sell at profitable levels and thus ensure the continued reproduction and enlargement of the system(Luxemburg 2003, Marx 1991, 1993, 422). Whilst this is a general trajectory that unfolds in all societies dominated by the capitalist mode of production it takes specific forms, moves at specific speeds and suffers from specific points of fracture in specific contexts. The social struggles of the 1960s and 70s threw the post-WWII Keynesian, Social Democratic & Fordist global order into crisis. 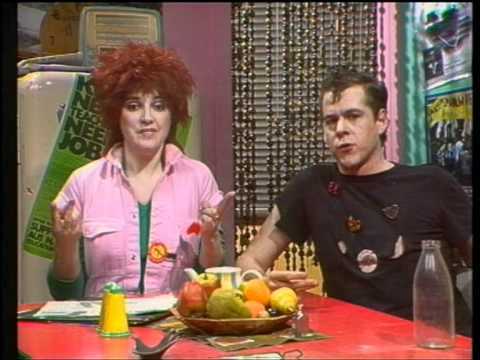 Capital’s response was ‘the new enclosures’: a radical reorganisation of accumulation, the global division of labour and life more generally (Midnight Notes Collective 1992). Industrial production shifted from the North to the South and there was a hypertrophic growth of finance as a source of profits, a way to fund the state whilst reducing corporate taxation and a bulwark for households against stagnating wages and as a way of increasing consumption(Lapavitsas 2013, Marazzi 2011). Work extended beyond the confines of wage-labour proper as capital subsumed more and more of society (Virno 2004). Women increasingly entered the workforce as well as remaining the primary labourers performing the unwaged work of reproduction(Federici 2012). The increased debts in the North generated the aggregate effective demand to purchase commodities from the South – the export led industrialisation of China being the key example(Varoufakis 2011). This reorganisation opened the way to increased levels of accumulation and the return of profitability(Panitch and Gindin 2013). It also required new forms of discipline and order (‘Empire’ and ‘the society of control’) and saw the proliferation of nihilistic conflicts and violence(Hardt and Negri 2000) . This new order, often called ‘neoliberalism’ or ’globalisation’ solved, or at least displaced, the problems of the 1970s by generating the basis for the crisis that was to come. In this global order Australia exported high volumes of natural resources at very high prices – especially to China who stood at the centre of export driven industrial production. A great deal of capital was accumulated not just through exporting resources but also through the construction of mines. This was the mining boom. However this global order had a heart attack in 2007. The expansion of financialisation had worked as a general cover for the declining profitability of capitalism; its implosion was both a violent shock in itself but also exposed the underlying barriers and limits to accumulation. The global response to the crisis was a combination of bailing out the financial institutions, attempts at austerity to address ballooning state debts, attacks on accumulated conditions, wages and the social wage and more recently unorthodox monetary policy in the attempt to stimulate investment and spending. Austerity (now forsaken by many of its former proponents) led to the intensified contraction of accumulation and unorthodox monetary policy led to a vast increase in the value of financial assets based on the promise on even more cheap money tomorrow but has created also the threat of monetary instability. With the implosion of demand in the North the Chinese state has tried to create various forms of economic stimulation via infrastructure development, real estate speculation and financial speculation. This has simply shifted the problem around and generate more and more debt (Lin 2015). The increasingly poor news about the level of growth in China has shown just how much there has been a drop in demand for resources and thrown the financial markets into misery. It is this complex global malfunctioning that is the reason for the end of the mining boom: there has been a drop in the global demand for resources as part of the general decline in capital accumulation. The scale on investment during the boom has also increased supply thus further contributing to plummeting prices. This is being experienced in Australia as declines in growth, incomes and profitability. Thus the cause of worsening conditions for capitalism in Australia can’t be explained either by the impact of rising debts as the Coalition argues or the impact of a drop in confidence due to talking down the economy as the ALP argues. Though rising debts and falling confidence are both symptoms of the malaise. 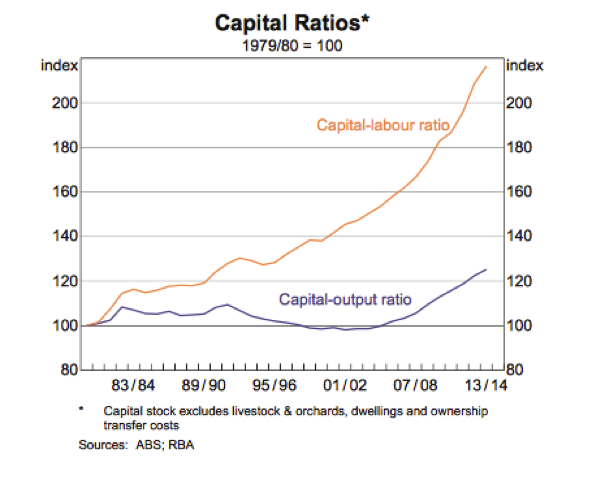 The pulse-rate of capital accumulation in Australia. Projections of future improvements in growth are based on optimistic expectation about future gas sales; take for example the ridiculous figures in the Queensland Budget(2015). However recent reports detail the failing profitability of this sector and thus we should take these unbelievable projections of future growth levels as being unbelievable(Fullerton 2015). Current IMF research on declining commodity prices predicts ‘recent declines in commodity prices could shave off one percentage point annually from the growth rate of commodity exporters over 2015-17 as compared with 2012-14…’(2015a). The mainstream indicators certainly show us some things about the direction the capitalist mode of production in Australia is heading. What is strange though is that profit is only a minor category in analysis. Following on from classical political economy (and its major critic Marx) we know that profit, the transformation of money into more money, is the basic driving logic of capitalism. The growth of capitalism is determined by how successfully firms are able to take a sum of money and turn it into more money. The overriding determining factor of capitalist firms’ levels of investment (and thus economic growth) is their current profitability and their expectations of future profit. (A complication is in recent history profits are increasingly not reinvested in productive activity per se but channelled towards financial markets) (Reuten 2011). 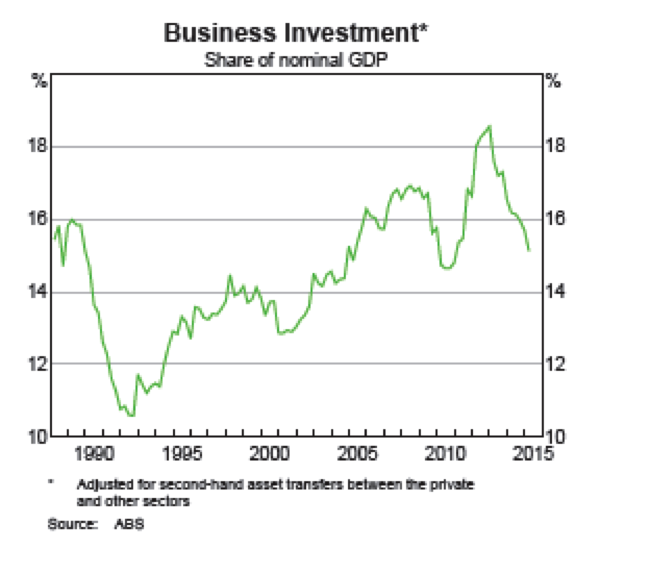 Profits for Australian business have declined: the RBA reported in August a drop in mining company profits by 22% and the ABS reports that overall profits have declined by 4.9 (3.9% seasonally adjusted over a year)(2015b, 2015b, 34). (However when these stats are broken down there are different movements in profitability depending on the industry – and of course industry-based stats could also be broken down to a company level). Australian banks remain very profitable. However Goldman Sachs(Cauchi 2015) is concerned that future declines in mortgage and consumer credit demand will undermine their profits and the IMF(2015c) is worried that there are ‘long-standing structural vulnerabilities’: specifically their dependence on international capital and their relatively low level of reserves . Each firm can be said to have a rate of profit: that is the ratio between capital invested (on machinery, supplies, etc and labour in the form of wages) and the profit realised by the sale of commodities and services. Marx (1991) argued that there is a tendency to create an average rate of profit in the capitalist mode of production on a whole as capital flows from investment to investment in the search for profit. Unprofitable companies are crushed by ‘the coercive laws of competition’ (Marx 1990, 433). Even more than this Marx claimed that profit has a tendency to fall as proportionally the amount of capital spent on machinery etc. rises in relation to that spent on labour. There have been vast torrents of ink spilled in debates about these two claims. On the tendency for the rate of profit to fall there is a debate about how important this argument is in Marx’s overall work and if it is actually possible to empirically verify it. The rate of profit often takes on a political-theological hue as it is meant to prove before the fact the coming of the next crisis and thus (fingers crossed) revolution. As a broad argument I find it generally convincing. That the drive of capitalism to increase productivity to increase profits results in a greater proportion of capital spent on technology in relation to labour seems broadly true. As does the resulting conclusion that since at a base level the origin of profit is the exploitation of labour then increased investment in technology leads to a decline in profit in relation to total capital invested. In this sense capitalism’s very success sees it propelled in a direction that undermines its core rationality. To me this is a key part of the critique of capitalism: the contradiction between the creative capacities that capitalism mobilises in the pursuit of accumulation and the social relations that enmesh these capacities (Marx 1970, 21). I am less convinced by attempts to explain every drop in capital accumulation in reference to the rate of profit to fall. 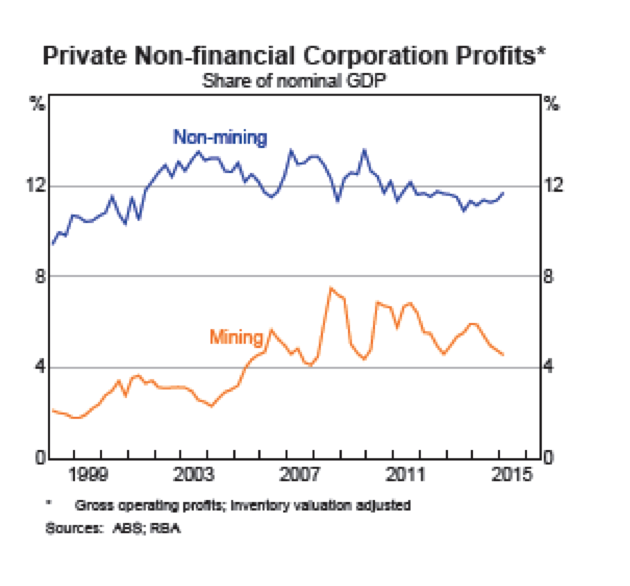 That said there is an argument to be made that the profit rate in Australia has stalled for a decade then declined. 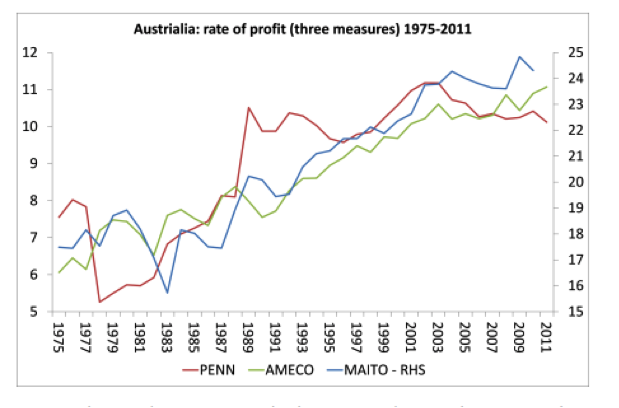 Below are two recent attempts to present the rate of profit in Australia. However there is a vast difference between how the average rate of profit exists in the mind of the Marxian critic (who constructs an average from data) and the actual unending and undulating processes of creating an average rate of profit as capital moves across society. Indeed a particular barrier to capital accumulation during the mining boom was the retardation of the formation of an average rate of profit and the creation of a two-speed or patchwork economy. The physical realities of mining created a limit to the formation of an average rate of profit. I’m also not convinced of the utility of constructing a rate of profit on a national basis. Part of Marx’s argument about the formation of an average rate of profit is an attempt to explain how the surplus-value that arises in firms that have low compositions of machinery to labour are realised by firms that have a high composition – this is a global dynamic with the former largely producing cheap inputs in the Global South. 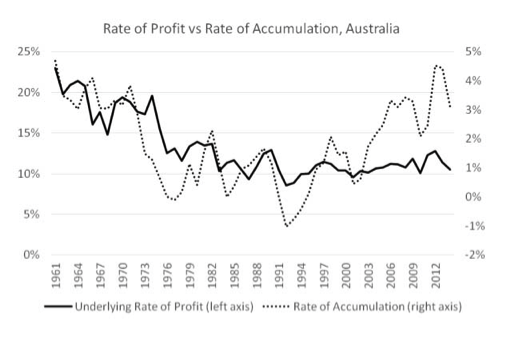 The reestablishment of profitability after the 1970s involved the shifting of production from the North to the South: this makes national rate of profit figures even more problematic. Also the rise financialisation needs to be addressed as well as the contemporary ways companies are valued either in relation to share-price and/or investment as is the case with the new ‘disrupters’. The rate of profit doesn’t appear in the minds of mainstream economists but productivity does. Marx’s critique of the classic political economists’ understanding of profit was that they didn’t grasp it in relation to surplus-value (1969, 40). This wasn’t just an intellectual failure, Marx went on to argue that the very processes of the capitalist mode of production obscure the origin of profit and in practice profits appears as just the difference between the costs of all inputs and the sale price of outputs. Surplus-value is the ‘invisible essence’ whilst profit is the ‘surface phenomena’ (Marx 1991, 134). In a complex capitalist society profit become a proportional relationship of the amount of capital invested. Surplus-value expresses conceptually the secret of exploitation that lies at the heart of capitalism. Contemporary mainstream economics goes a step further and replaces the analysis of profit with one of productivity. (I assume this is because for this tradition the market is just the mechanism for the efficient distribution of utilities and prices function simply as an information system between the supply of limit resources and manifold unlimited desires. This of course is wrong. The capitalist mode of production’s core desire is the accumulation of capital, the transformation of money into more money ad infinitum, and wealth or utilities simply function as the path that money needs to take to expand)(Marx 1991, 132). We are constantly, incessantly, told by media and thinkers for capital of the need to increase productivity and that the way to increase productivity is reform. The National Reform Summit(2015) was a case in point. It is most commonly claimed that we can only have rising living standards and increasing growth through reforms that result in increased productivity. However when we look at this mainstream debate we see the outline of a phenomena that seems very much like the tendency of the rate of profit to decline: a proportional increase of investment in capital in relation to labour and a diminishing level of returns in relation to overall investment. Of course profit and productivity in everyday language are two different things. Profit measured in money is the difference between the costs of inputs and prices received for outputs; productivity measured in actual units of what is produced is the relationship between the volume of inputs used in production and the volume of things produced. If I ran a bakery my profit would express a relationship between the costs of production and the money made in sales; productivity would express a relationship between the material volumes of ingredients, the amount of machinery and tools used, hours worked and how much bread, croissants and cheesymite scrolls was baked. Of course there is relationship between productivity and profit: as a general rule each capitalist firm tries to increase the productivity of production as a way to maximise their profits. The graph below, which stops in 2012, shows a remarkable decline in the productivity of capital. There is some mainstream commentary that argues the profits of the mining boom hid this deeper tendency – and now that tide has dropped the wreck on the beach is exposed bare. Indeed looking at the mining industry one of Australia’s premier thinkers for capital Saul Eslake argues that that the mining boom saw an increase in the employment of labour and capital (a doubling of working hours and an increase in productive capital stock by 80%) but gross value added output only rose by 37% due to the large lead times of getting projects off the ground. This means that labour productivity declined at an annual rate of 6.2% and 41% in total and multifactor productivity declined by an average annual rate 4.5% since 2000/1 or by 34% in total. This decline in productivity and the mining of low-grade deposits (a generally unproductive pursuit) was made viable due to higher prices. Higher prices which no longer exist (Eslake 2011, 229). In summation then: growth is down, investment is down, profits are down and productivity is down. Capital accumulation in Australia is looking unwell. Queensland Budget 2015-16: Budget Strategy and Outlook Budget Paper No.2 Available from http://www.budget.qld.gov.au. Australian Bureau of Statistics. 2015a. 5260.0.55.002 - Estimates of Industry Multifactor Productivity, 2013-14 Australian Bureau of Statistics, [cited 28th September 2015]. Available from http://www.abs.gov.au/AUSSTATS/abs@.nsf/Lookup/5260.0.55.002Main+Features12013-14?OpenDocument. Australian Bureau of Statistics. 2015b. 5676.0 - Business Indicators, Australia, Jun 2015. Australian Bureau of Statistics [cited 30th September 2015]. Available from http://www.abs.gov.au/ausstats/abs@.nsf/mf/5676.0. Dauvé, Gilles. 2015. Crisis of Civilisation. libcom.org [cited 15th September 2015]. Available from https://libcom.org/library/crisis-civilisation-gilles-dauvé. Eslake, Saul. 2011. "Productivity: The Lost Decade." In Australian Economy 2000s in the Proceedings of a Conference Held in Sydney on 15–16 August 2011 edited by Hugo Gerard and Jonathan Kearns, 223-254. Reserve Bank of Australia. Federici, Silvia. 2012. Revolution at Point Zero. Oakland CA: PM Press. Fullerton, Ticky. 2015. Dr Graeme Bethune Speaks to the Business. The Business [cited 22nd September 2015]. Available from http://www.abc.net.au/news/2015-09-22/dr-graeme-bethune-speaks-to-the-business/6796532. Gordon, Jenny, Shiji Zhao, and Paul Gretton. 2015. 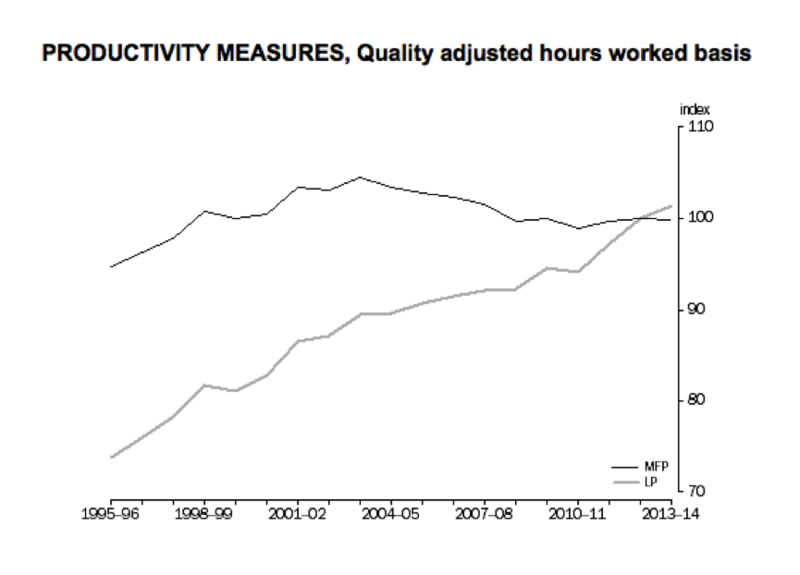 On Productivity: Concepts and Measurement: Productivity Commission Staff Research Note, Canberra, February. Hardt, Michael, and Antonio Negri. 2000. Empire. Cambridge, Massachusetts & London, England Harvard University Press. International Monetary Fund. 2015a. Commodity Exporters Facing the Difficult Aftermath of the Boom [cited 30th September 2015]. Available from http://www.imf.org/external/pubs/ft/survey/so/2015/RES092815A.htm. International Monetary Fund. 2015b. Global Financial Stability Report—Vulnerabilities, Legacies, and Policy Challenges: Risks Rotating to Emerging Markets: (Washington, October). International Monetary Fund. 2015c. Imf Country Report No. 15/274 Australia 2015 Article Iv Consultation—Press Release; Staff Report; and Statement by the Executive Director for Australia. International Monetary Fund. 2015d. World Economic Outlook: Adjusting to Lower Commodity Prices. . Washington (October). Jones, Peter. 2015. Economic Shock as Mining Boom Evaporates. solidarity.net.au [cited 22nd September 2015]. Available from http://www.solidarity.net.au/mag/back/2015/76/economic-shock-as-mining-boom-evaporates/. Lapavitsas, Costas. 2013. Profiting without Producing: How Finance Exploits Us All. London & New York: Verso. Lin, Kevin. 2015. Anatomy of a Collapse. Jacobin [cited 25th August 2015]. Available from http://www.jacobinmag.com/2015/07/china-market-collapse-communist-party. Luxemburg, Rosa. 2003. The Accumulation of Capital. Translated by Agnes Schwarzschild. London & New York: Routledge. Marazzi, Christian. 2011. The Violence of Financial Capitalism. New ed. Los Angeles: Semiotext(e). Marx, Karl. 1969. Theories of Surplus Value Part 1. Translated by Emile Burns. Moscow: Lawrence & Wishart. Marx, Karl. 1970. A Contribution to the Critique of Political Economy. Translated by S.W Ryazanskaya. Moscow: Progress Publishers. Marx, Karl. 1990. Capital: A Critique of Political Economy. Translated by Ben Fowkes. Vol. 1. London: Penguin Classics. Marx, Karl. 1991. Capital: A Critique of Political Economy. Translated by David Fernbach. Vol. 3. London: Penguin Books in association with New Left Review. Marx, Karl. 1993. Grundrisse: Foundation of the Critique of Political Economy (Rough Draft). London: Penguin Books. Midnight Notes Collective. 1992. "The New Enclosures." In Midnight Oil: Work, Energy, War 1973-1992, edited by Midnight Notes Collective, 317-333. Brooklyn,NY: Autonomedia. Moore, Jason W. 2003. "Capitalism as World-Ecology: Braudel and Marx on Environmental History." Organisation & Environment no. 16 (4):431-458. National Reform Summit. 2015. Statement from the National Reform Summit. Panitch, Leo, and Sam Gindin. 2013. The Making of Global Capitalism: The Political Economy of American Empire. London & Brooklyn, NY: Verso. Parham, D. . 2013. 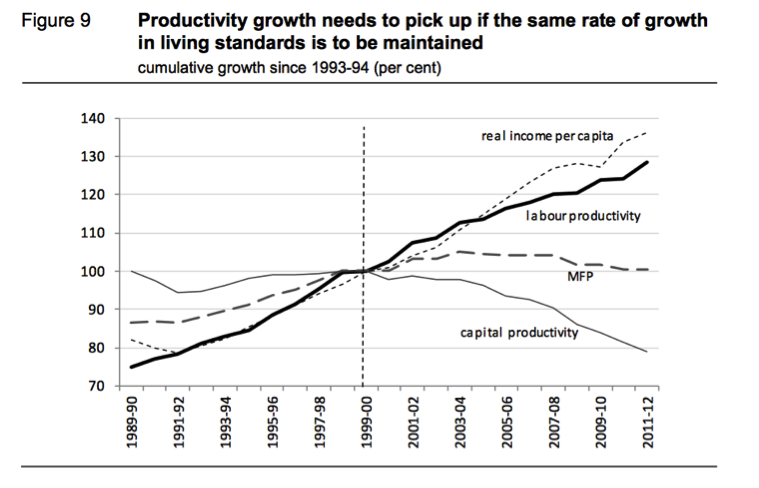 Labour's Share of Growth in Income and Prosperity. Canberra: Visiting Researcher Paper, Productivity Commission. Reserve Bank of Australia. 2015a. 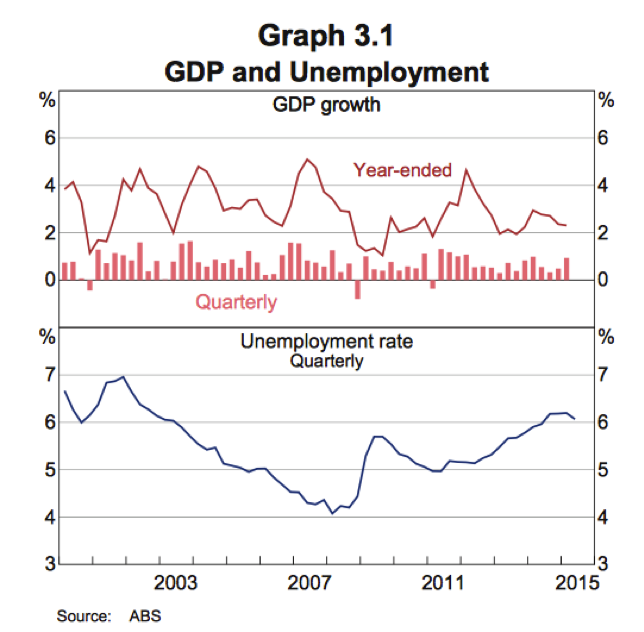 The Australian Economy and Financial Markets Chart Pack September 2015 [cited 24th September 2015]. Available from http://www.rba.gov.au/chart-pack/pdf/chart-pack.pdf. Reserve Bank of Australia. 2015b. Statement on Monetary Policy August 2015, [cited 24th August 2015]. Available from http://www.rba.gov.au/publications/smp/2015/aug/pdf/0815.pdf. Reuten, Geert. 2011. "Economic Stagnation Postponed." International Journal of Political Economy no. 40 (3):50-58. Roberts, Michael. 2015. Australia: The Lucky Country. The Next Recession [cited 15th September 2015]. Available from https://thenextrecession.wordpress.com/2015/09/02/australia-the-lucky-country/. Varoufakis, Yanis. 2011. The Global Minotaur: America, the True Origins of the Financial Crisis and the Future of the World Economy. London & New York: Zed Books. Virno, Paolo. 2004. A Grammar of the Multitude. Los Angeles, CA & New York,NY: Semiotext(e). could you attach that here as well? With Sober Senses is a new project in which I am trying to reorientate my research and writing towards mapping out the territory of capital accumulation with Australia, in a way I hope will reach a larger audience and may be useful for those trying to understand and change the society they live in and make up.